While I was researching for my PhreakNIC X presentation on Bart's PE Builder I began to play around with booting it from a USB Thumbdrive (Also know as a USB Flash Drive - UFD). In the process, I began to wonder if you could dual boot it with Slax Linux to make a very handy recovery system you could carry around in your pocket. I found Thibeact's notes on the 911 CD forums ( http://www.911cd.net/forums//index.php?showtopic=10806&st=220&p=98227&#entry98227 ) and modified them to fit my needs. 2. 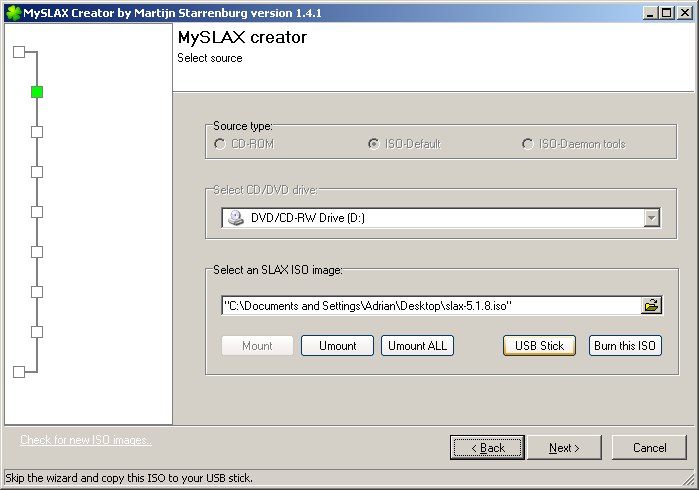 Once you have MySlax running choose the ISO-Default radio button, choose the Slax based ISO you wish to use, click the "Mount" button then hit the "USB Stick" button. You should be able to use any Slax based ISO as your source, including normal Slax, BackTrack or Slast. 3. Click the "Create USB Stick" button, then when the format dialog comes up make sure you choose FAT (not FAT32) and click start. The UFD must be formatted as Fat16 for BartPE to work right in the later steps. 4. 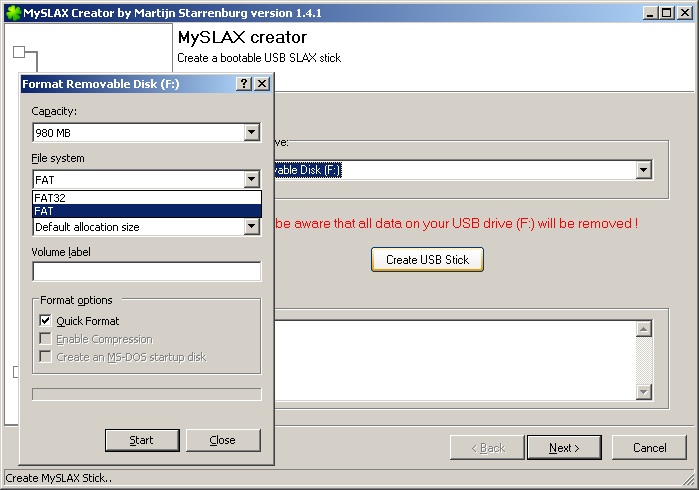 Click "Next" and MySlax will being putting the need files to boot Linux onto the UFD (USB Flash Disk). When it finishes confirm its completion by click the "Success" button. 5. Now would be a good time to make sure you have a valid Pe Build to use. 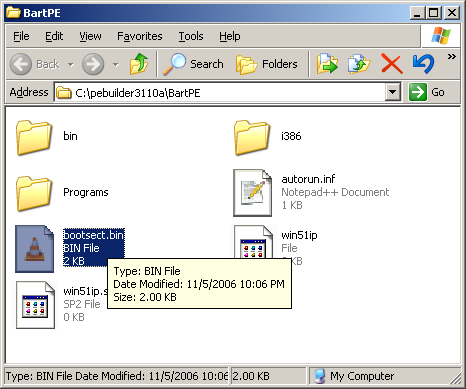 Start Pe Builder, set the media output to none since we won't be building a normal CD ISO, then click the "Build" button. 6. 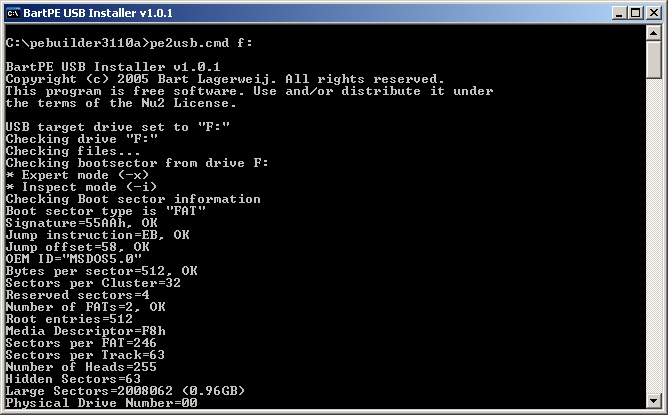 Once PE Builder is done building your system, drop out to a command line, go into your Pe Builder install directory and issue the command "pe2usb.cmd <USB-Drive-Letter>" where <USB-Drive-Letter> is whatever drive letter your UFD is mount as. In my case that's F:. You may want to copy the above image to the root of your USB drive, or make a PNG of your own to use. 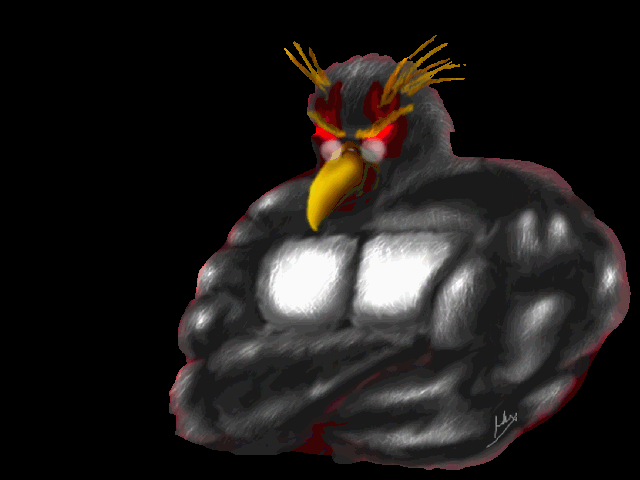 As long as it's a 640x480 PNG named mascot.png it should work fine with my syslinux.cfg. and place it at the root of your UFD. We will be using this tool later to fix the boot sector of the UFD. 9. 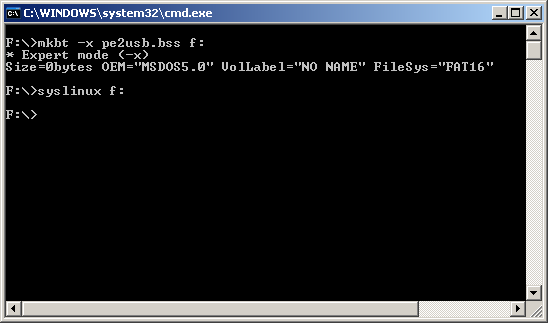 Copy pe2usb.bin from the root of your PE Builder install (c:\pebuilder3110a in my case) to the root of your UFD and renamed it to pe2usb.bss. This step is very important, the bss extention must be there so SysLinux knows what sort of kernel/boot sector it is. I chose the syslinux-3.31.zip archive. Once you have the archive downloaded extract the files \win32\syslinux.exe and \com32\modules\vesamenu.c32 then place them in the root of your Thumbdrive. 12. Now you can reboot the system and try to boot from your thumbdrive. Your BIOS must support booting from USB, so it's won't work on all systems. A quick side note, one of the great things about Slax is how easy it it to add extra software. 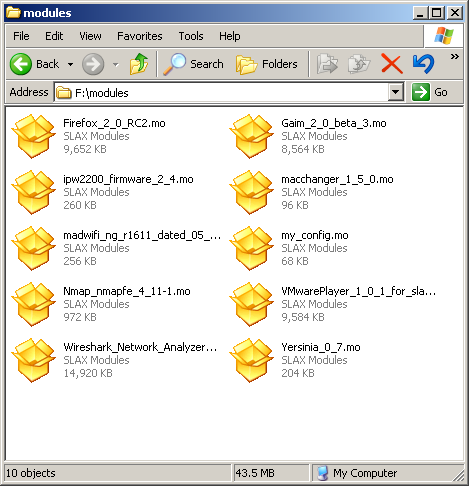 Just download the modules you want from http://www.slax.org/modules.php and put them in the modules folder on your UFD. I hope that this tutorial was helpful to you. If you think I should make a video on this topic just email me and ask.